When you’ve got a craving, forget take-out – go ahead and make it yourself! This is what I did when I was longing for the rich flavours of Thai Green Curry Beef. Here I am, so proud – I’m finally following my goal to cook more. I’m no stranger to the kitchen. In fact, I bake on a daily basis. But, guys, here’s the thing – I am notorious for ordering food – and so is my husband. After a long day, there’s nothing like having someone serve you a hot meal – or, in this case, bring it to your door. However, ordering take-out was burning a hole through our wallets. Plus, it took away the fun in cooking together – an activity we loved doing pre-parenthood. So, as a couple, we decided it was time to ditch the delivery service, and cook more often together. Obviously, we haven’t completely abandoned the idea of ordering from our favourite restaurant, but we do it much less frequently. 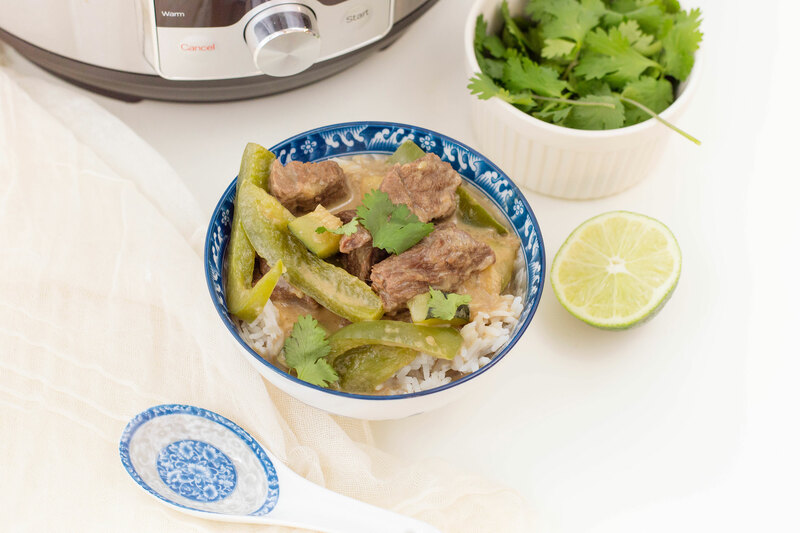 Recently, I found myself craving my favourite Thai-inspired dish: Thai Green Beef Curry. Rather than heading over to the local restaurant to fulfill that craving, I researched and developed a recipe of my own. It was incredibly satisfying to have it come out exactly how I planned. What’s great about cooking is the manipulation aspect when altering flavours, textures, etc., and create a dish exactly to your liking. 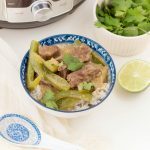 While most Thai Green Beef Curry recipes tend to have have a strong kick of spice, I‘ve held back on certain ingredients to keep it on the milder side. 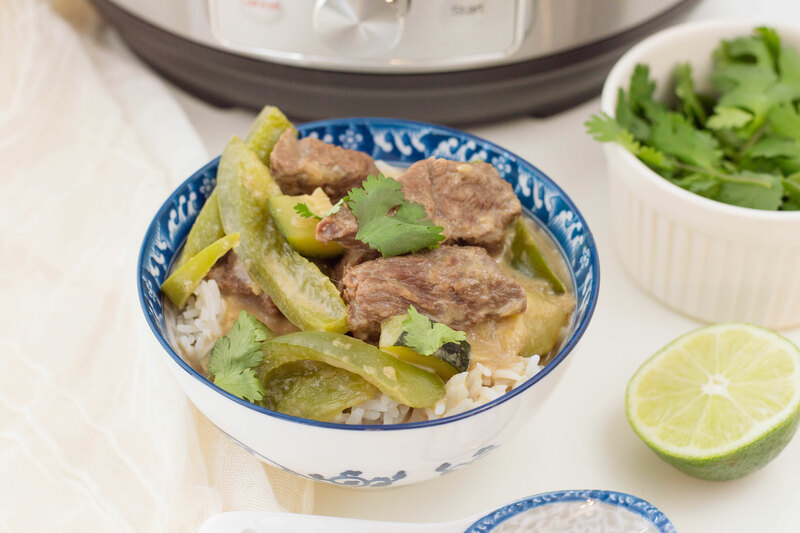 This Thai-inspired dish is full of flavour and made directly in your Instant Pot. Set Instant Pot to saute function and pour vegetable oil. Give it one minute to heat up. Add chopped onion and minced garlic into the pot - stirring and mixing for about 3 minutes. Add stewing beef and brown on all sides, this should take about 5-7 minutes. Add half of your coconut milk and green curry. Stir until it starts to bubble. Add the remainder of your coconut milk as well as your vegetable broth. Close the lid of your Instant Pot and set on manual pressure, high, for 15 minutes. Once the time is up, set for a 15 minute NPR. As you wait for the pressure to release, prep your veggies by cutting your green pepper in strips (be sure to take out the center + seeds) and chop your zucchini. Remove the lid from the Instant Pot. Set the Instant Pot back to the saute function and add brown sugar, the juice of your lime, sliced green pepper, and chopped zucchini. Let cook for about 5-6 minutes, stirring occasionally. Turn off saute function and serve over a bed of rice. Garnish with coriander. Enjoy! I shopped at our local Asian market for most of these ingredients. It made me extremely nostalgic going through the aisles, as this is where my mother did the majority of her grocery shopping when I was growing up. All thanks to mama, I knew exactly what brands to reach for. She came over a day before I was making this dish. When she spotted my coconut milk in the pantry she said, “Oh good. You chose the good brand!” Safe to say, I was extremely proud. Now, I have a whole jar of green curry in my fridge and I’ve got to figure out what to do with it! Any suggestions? Drop me a line in the comments below and I’ll try my best to feature it here on the blog! Do you find yourself ordering take-out very often? What do you do to diminish this habit? I am totally with you on this! If I can make it at home I will. I rather save my money for traveling. This looks amazing and I am definitely going to try it. 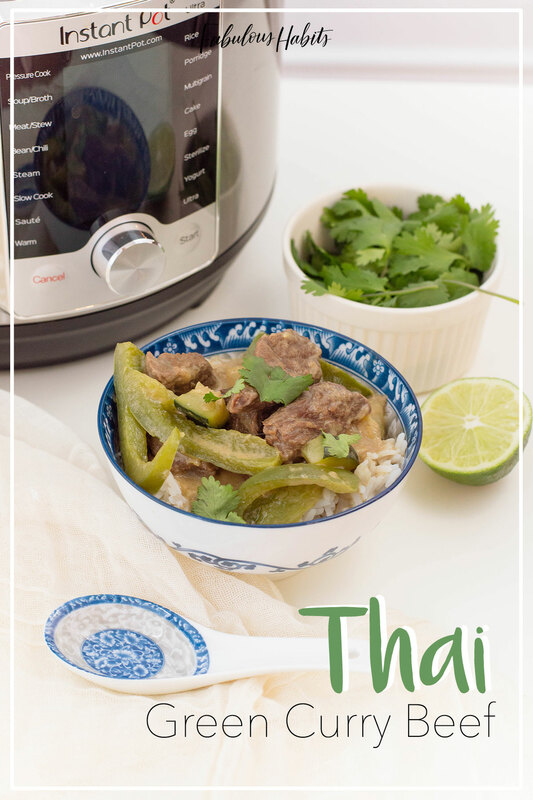 ugh i def need to get an instant pot bc these recipes look so yummy and easy to make- were a huge thai curry fan so id love to try this soon! This looks so good and I love that it’s made in the instant pot. I think I have everything on hand to try this recipe – even the coconut milk! I have never had Thai Green Curry Beef before. I would like to make this. Good thing is, ifI like it (I’m sure I will! ), I have the recipe for whenever the mood strikes me! Oh yum, this looks so amazing. I always like my food to have a kick to it. And I need to use my Instant Pot more often. I feel like I need to get on board with Instant Pot cooking! This delicious Thai recipe you just shared may actually be the tipping point! I may need to buy one this weekend. We try to minimize eating outside the house and our Instant Pot helps so much since it takes no time to prepare our favorite dishes. I love our instant pot but I don’t use it nearly enough. This recipe looks delicious and sounds easy to make. Gotta try this thai curry dish for sure. This recipe looks so savory. My son would really love this recipe. It would be perfect to add to our menu plan for next week. We hardly ever get delivery. I don’t make a lot of Thai inspired food, but I really love it. I’ll have to try and make this recipe. I am not a big curry fan, but I think I could replicate your recipe without it. You make this sound so delicious! My husband love curry dishes. I seldom make a curry dish because I find the flavor very strong but I can eat it once in a while. I prefer home-cooked meals more than anything. But I don’t think I’ve ever had curry beef before. I did have chicken curry. Can’t wait to try your recipe. Looks delish! 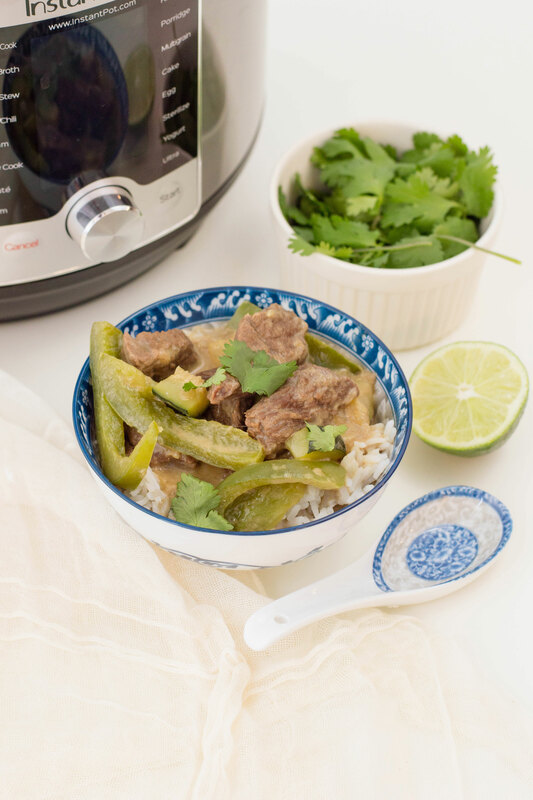 Instant pot is a must a have in the kitchen! This looks so delicious! This looks absolutely amazing and I’m always looking for a new recipe to try in my Instant Pot. Plus this is healthy so it’s a win-win in my book. Thank you! 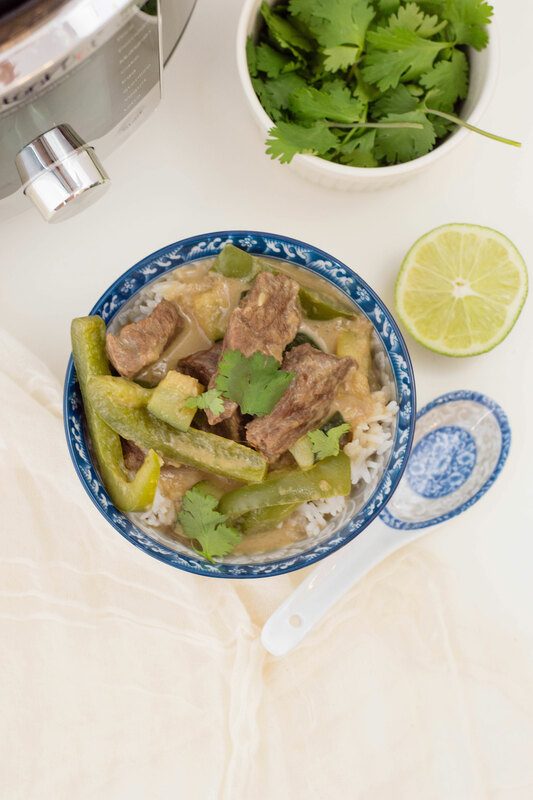 Ah this green curry beef looks amazing. I attempted making curry sauce a while back and it failed. Might have to try this Instant pot recipe as it looks a lot more straightforward (and delicious). I love a good curry and this doesn’t look like it’s going to disappoint. Thanks for sharing! This sounds delicious. I need to start using my pressure cooker more and this seems like a good recipe to start with to get me motivated to do so! My husband LOVES curry! I can’t wait to give this a shot to see what he thinks! I keep hearing so much about these Instant Pots! I need to get one, I think. This recipe sounds so good and easy! I used to order take out often but I enjoy the taste of home cooked food because it makes me feel good and not sluggish. I really like this recipe. I’ve been wanting to try a Curry recipe but wasn’t sure how to make it. I love the flavor of curry. My husband and I both love curry. This is a dish I look forward to the both of us making together. I don’t think I’ve had a dish like this before. It does sound delicious. Sure to cure any cravings! A good excuse to use my instant pot too! Cooking was so much fun when I used to stay alone till a couple of years back. I too need to get back now to cooking mode. Thus recipe looks good. Local Asian markets are THE BEST! This recipe is super practical and simple – and perfect for a curry freak like me! That is how I like to do it anymore. I make all of my favorite dishes from scratch and it is delicious. I seriously need to give it a try! Looks really delish!